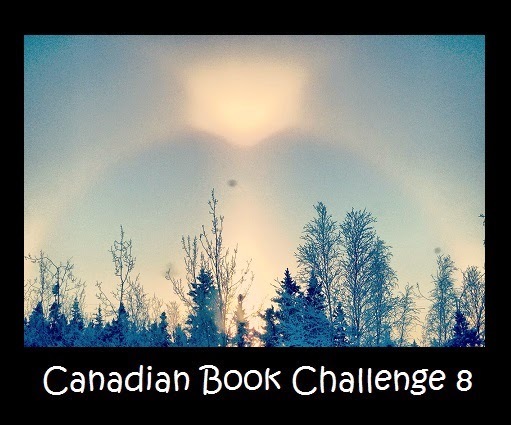 I must do some round-up posts – I have ten months’ worth of miscellaneous stray reads stacked up and begging to be re-shelved, but I don’t feel that I can happily do that until I at least give them a quick summation. Most books worthy of time spent reading them deserve thoughtful posts all to themselves, and I wish I could do that, but life is full of a variety of occupations, and there are still only twenty-four hours in each day. Well, here we go. Hang onto your hats, people, for if all goes well the next few days will see a flurry of micro-reviews. Looking Up by Jane Boyle Needham, as told to Rosemary Taylor ~ 1959. This edition: G.P. Putnam’s Sons, 1959. Hardcover. 191 pages. 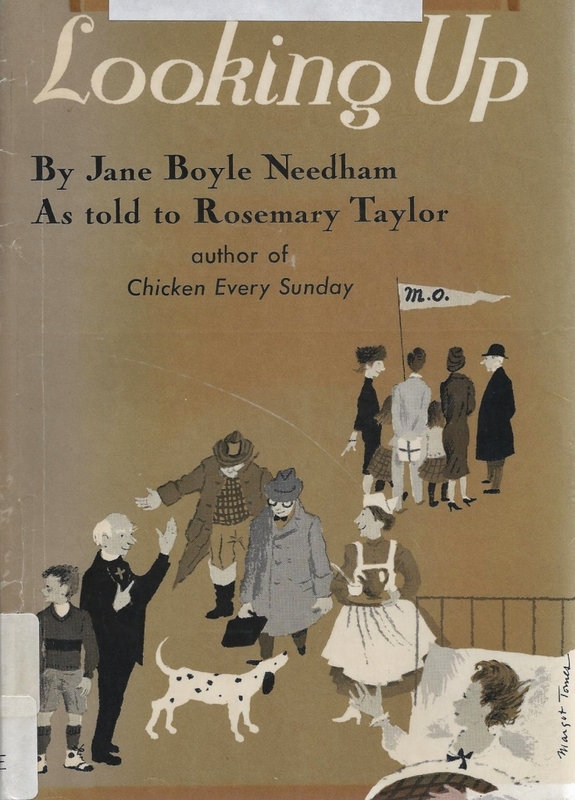 This was a rather unusual memoir, narrated by the author to journalist/memoirist Rosemary Taylor (Chicken Every Sunday, Harem Scare’m) for the very good reason that the subject was paralyzed from the neck down as a result of adult-acquired bulbar (affecting the brainstem) polio in 1949, when she was 27 years old. Jane Needham lived in an iron lung for thirteen years, until dying from complications of gall bladder surgery in 1962. Looking Up was written when Jane Needham had been in the iron lung for nine years. She was, as she well knew, living on borrowed time. After five years in hospital, Jane Needham decided that she needed to make a concerted effort to provide as “normal” as a home as possible for her three children. She had been unexpectedly divorced by her husband several years earlier and had with difficulty retained custody of her young children. Her elderly parents liquidated their assets, moved into an apartment, and purchased a house for Jane, the children, and Jane’s round-the-clock private nurses. Unable to breathe on her own, and never regaining more than twinges of movement in her extremities, Jane did create a functional home and proceeded to confound the naysayers who predicted disaster. 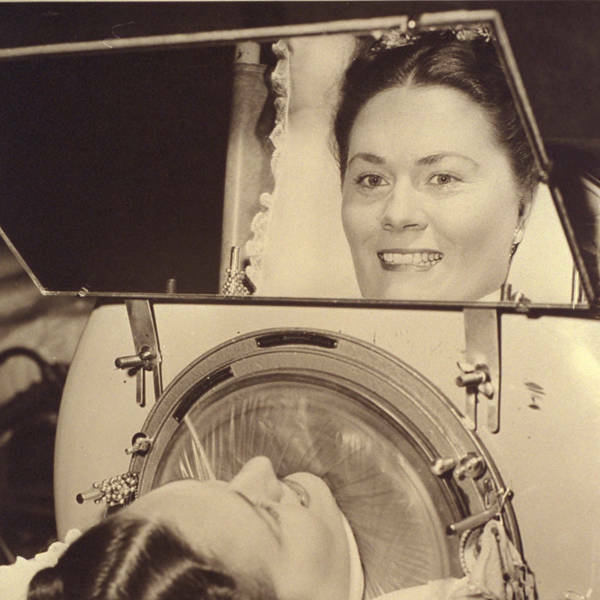 Jane Boyle Needham, quite literally “looking up”, into the mirror attached to her iron lung, which allowed her to view her world. The tone of this book is rather unrelentingly cheerful; one might call it positively inspirational. Jane Boyle Needham comes off as a darned good sport, even when relating her experiences with her rather caddish husband. Perhaps her strong Catholic faith had something to do with this? Towards the latter part of the memoir Jane goes on at great length about the strength her faith has given her, and the spiritual and moral assistance given to her by her parish priests. Or perhaps the positive tone was partly façade? But Jane does manage to occasionally convey the anger at her fate and the anguish of her spouse’s betrayal; occasionally she is downright cutting, and those bits are a relief, because otherwise this woman’s saintliness and fortitude would be much too good to be true. This book, something of a bestseller in its time, is a fascinating glimpse into the world of the many polio sufferers whose lives were saved by the invention of the iron lung and various portable breathing apparatus. Every breath was a struggle, brutal physical pain was a constant, and death was ever-present, lurking around the corner. A few moments of electrical outage, and it could be game over, quite literally, unless one had an attendant who could immediately start manual lung compressions. The chirpy tone of Jane Needham’s narration serves to add piquancy to her tragic fate. She desperately hoped to live long enough to see her children make their way in the world; they would have been still in their teens when she died. I wonder what became of them? 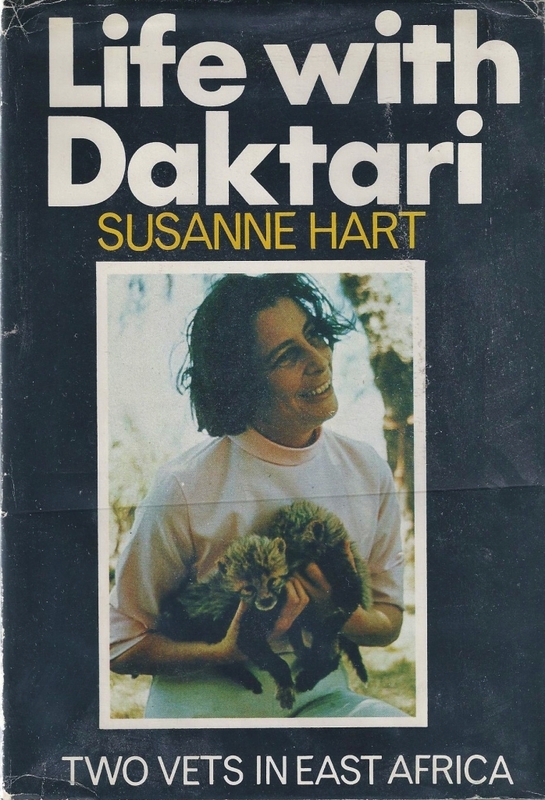 Life with Daktari: Two Vets in East Africa by Susanne Hart ~ 1969. This edition: Bles/Collins, 1969. Hardcover. ISBN: 7138-0234-0. 224 pages. Susanne Hart (her last name condensed from her second husbands surname, “Harthoorn”) loved animals from her childhood, studied at the Royal Veterinary College in London, England, and qualified as a vet in 1950. She found herself in South Africa newly divorced and with two young children to support, and she set up a thriving domestic animal veterinary clinic. Then she encountered a fellow vet whom she had known in college days, Dr. Toni Harthoorn, and gave up her practice to marry him and join him in Nairobi. Dr. Harthoorn specialized in working with wild animals, with particular expertise in immobilizing large creatures such as rhinos and elephants to be studied and fitted with radio collars. Susanne found herself becoming involved in her husband’s interests, and the two soon started working as something of a team, though Toni insisted that Susanne preserve a womanly decorum by avoiding the more dangerous situations that their work invariably entailed. This is an uneven memoir, in that it has a rather hero-worshipping tone to it. Susanne goes on at great length about her second husband’s brilliant technique with wild creatures; the two of them also become acquainted with the famed Adamsons of Born Free fame, Joy and George, and their lion study project. The animal bits are much the best, and I found the accounts of various encounters with wild and semi-wild creatures quite mesmerizing, but I could have done without the preachy details of Susanne Hart’s vegetarianism and special “health diet”, which she apparently pushed on every one of her acquaintances. She is quite snooty about those who don’t immediately fall in with her notions in this area, and it rather put me off. I bogged down somewhere around the middle of this promising sounding but ultimately awkwardly written book, and had to force myself to finish it; a rather disappointing state of affairs as I had wanted to like it so very much. Susanne and Toni were obviously passionate about their life callings, and their impatience with other people who didn’t quite embrace their ideas with full fervour is understandable, but the impression I received was that the reader was rather included with those not really “on side”; there is the faintest hint of patronization in Susanne Hart’s tone, and it left me not at all eager to seek out any of her other memoirs, of which there are something like eight or nine. Susanne Hart was also active in environmental outreach, and hosted a short-lived television series, Animal Ark, featuring a group of children being introduced to various African creatures. In later years she was deeply involved in an organization assisting African children whose parents had died of AIDS. Susanne Hart was still actively involved in her social charity work when she died in South Africa in 2010, at the age of 83. Susanne Hart was no doubt an admirable woman in many ways, and I feel rather like a rotter for not liking this memoir more, but there you have it. She annoyed me as much as she informed and entertained me so she gets a generously conditional “5” on my personal rating scale. 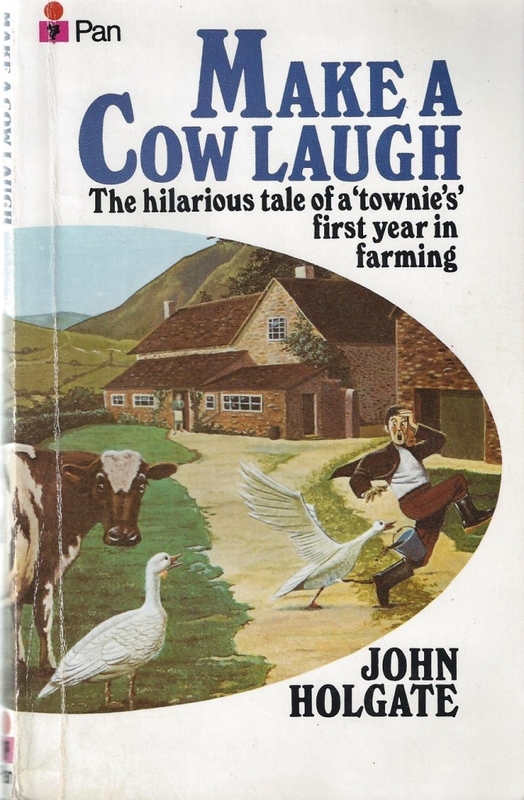 Make a Cow Laugh: A First Year in Farming by John Holgate ~ 1977. This edition: Pan, 1980. Paperback. ISBN: 0-330-25780-3. 221 pages. Despite the off-putting front cover blurb – “The hilarious tale of a ‘townie’s’ first year in farming” – I found myself liking this book a lot. “We moved to the country, and look how stupid we were!” self-mocking memoirs are a dime a dozen, and I almost didn’t pick this one up, but a quick peek at the contents inspired me to give it a go. It rewarded me for my bravery by being quite a nice little neophyte farmer’s tale, and it wasn’t hilarious at all – what a relief! – merely gently amusing. John Holgate, his wife, and three children – sixteen-year-old son, eight-year-old daughter and four-year-old son – all make the move from city life in London to a 75-acre mixed farm on the Welsh border. 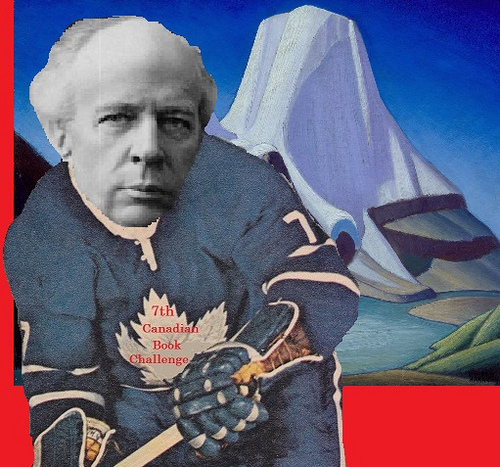 Their motivation is rather vague, even to themselves, but upon consideration John Holgate theorizes that it was a collective desire to leave the city for the emotional and aesthetic pleasures of rural life, and the more elemental challenges of “sweat labour” versus the hurly-burly bustle of the city, where he was successfully involved in a standard “career”. I am ashamed to say that I can’t quite recall what it was that John Holgate actually did in his London life. Or perhaps he didn’t tell us? My husband, who also read and enjoyed the book, can’t remember either, so perhaps it was a deliberate omission. In any event, it doesn’t matter, as the Holgates leave it all behind. They finance the purchase of the farm by selling their city house; money is tight and their subsequent financial struggles are completely believable. John Holgate is a more than competent writer; his words have a beautifully readable lyrical flow, and he is deeply, quietly funny. 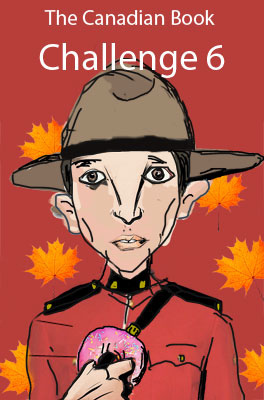 His characters are respectfully portrayed – no bumpkins here! 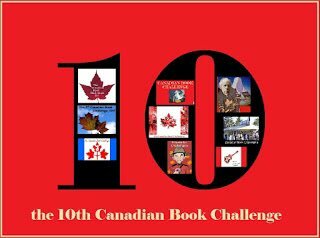 – and are utterly recognizable and familiar, even though we live in rural western Canada and the Holgates in far-off Great Britain. John’s relationship with his eldest son, who completely embraces the rural lifestyle, is a joy to read about. The whole book is a pleasant experience, in fact, and the Holgates come across as being truly nice people, with their share of human flaws, but with the most relatable good intentions. Not much happens in this memoir – no great disasters, no epiphanies, no real drama. At the end of Year One on the farm, things are plodding along quite nicely. John Holgate has been fortunate in his neighbours; they are keen to rally round when needed, and John has had the deep satisfaction of being able to lend a hand in his turn. Humourous incidents have indeed occurred, but none of them were “hilarious”, and that made me deeply pleased. John’s personal challenges ring true – spousal squabbles triggered by money stress and culture shock, the physical discomfort caused by moving from a sedentary to a deeply physical working day, the inevitable “second-guessing” of the decision to change one’s lifestyle in such an astounding way, the continual drama of dealing with farm animals – and are seen to be resolved in a sober and very true-to-life way. I would happily read John Holgate’s subsequent books. He wrote at least two more, On a Pig’s Back and A Sheep’s Eye View, and though I have no strong urge to go to a lot of effort to seek them out, I would be gently pleased to stumble across them on my travels. As I said before, the man can truly write, and a well-phrased, gently humorous, nicely realistic memoir which speaks highly of one’s own lifestyle choice is a desirable thing to have on the shelf.